"I created this smoothie recipe one morning to use up a pineapple I had. Even my husband, who doesn't care for smoothies, loved it!" 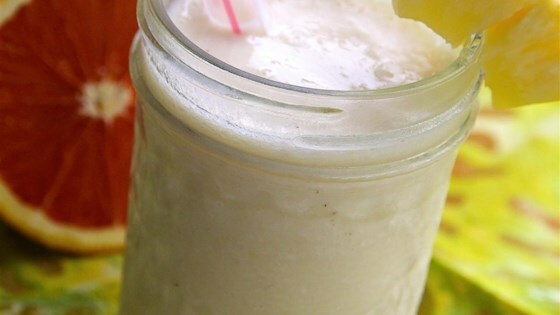 Blend pineapple, yogurt, banana, and orange juice together in a blender until smooth. Add ice and blend until ice is completely crushed and incorporated. This was absolutely delicious! Definitely my new smoothie go-to recipe. This is also great with some fresh kale and ground flax for an added nutritional boost. Mmmm-Mmmmm! I used half can of pineapple chunks and only 8 cubes. We have some lactose issues in our house so I used lactose free yogurt. Great smoothie! Thank you jenateare for sharing.